Showing items in category Bechuanaland, sorted by newest listed first. 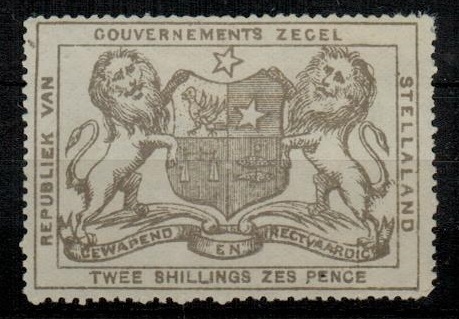 BECHUANALAND (Stellaland) - 1884 2/6d grey 'Republiek Van Stellaland' adhesive fine mint. 1884 2/6d grey 'Republiek Van Stellaland' adhesive in fine mint condition. Barefoot 5. 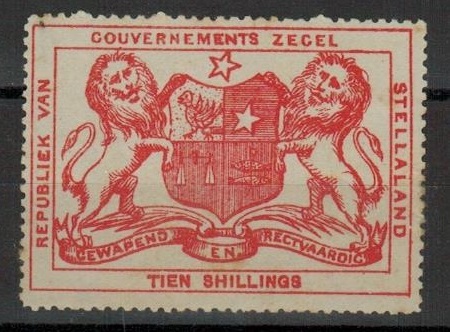 BECHUANALAND (Stellaland) - 1884 10/- red 'Republiek Van Stelland' adhesive fine mint. STELLALAND - 1884 10/- red 'Republiek Van Stelland' adhesive in fine mint condition. Barefoot 7. BECHUANALAND - 1938 (KE VIII) 'photographic' ESSAY of the proposed un-issued adhesive. 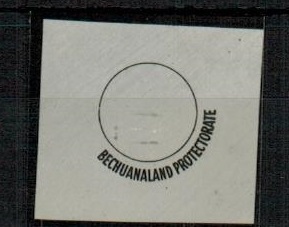 1938 (King Edward VIII) 'photographic' ESSAY of the proposed un-issued adhesive showing circle with BECHUANALAND PROTECTORATE in arc below. BECHUANALAND - 1888 1d brown PSC unused and handstamped SPECIMEN. H&G 4. 1888 1d brown on buff in unused conditon (some damp spotting) handstamped SPECIMEN. H&G 4. BECHUANALAND - 1915 9d rate registered cover to USA used at MAFEKING. 1915 (JU.11.) 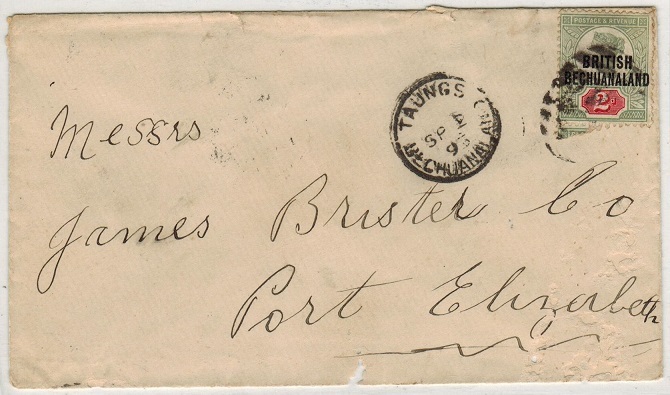 registered cover addressed to USA bearing South African 3d and 6d 'head' adhesives each tied by MAFEKING cds's. 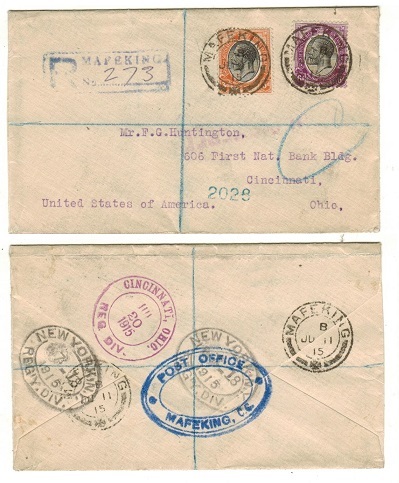 Large blue oval POST OFFICE/MAFEKING b/s. 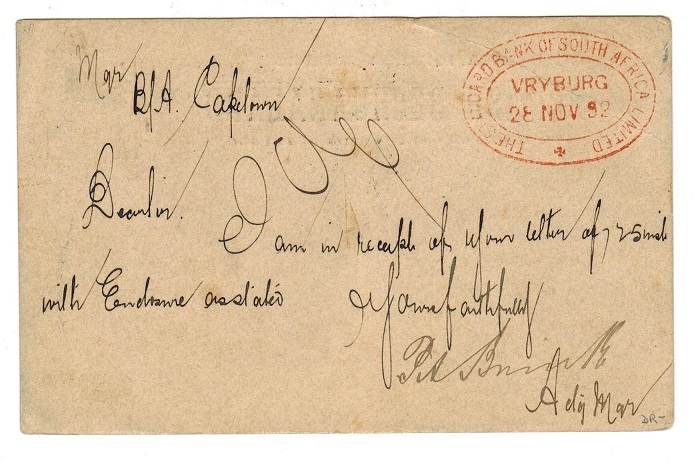 BECHUANALAND - 1915 cover to Pretoria bearing Transvaal 2d tied KEIMOES/BECHUANALAND. 1915 (NO.11.) 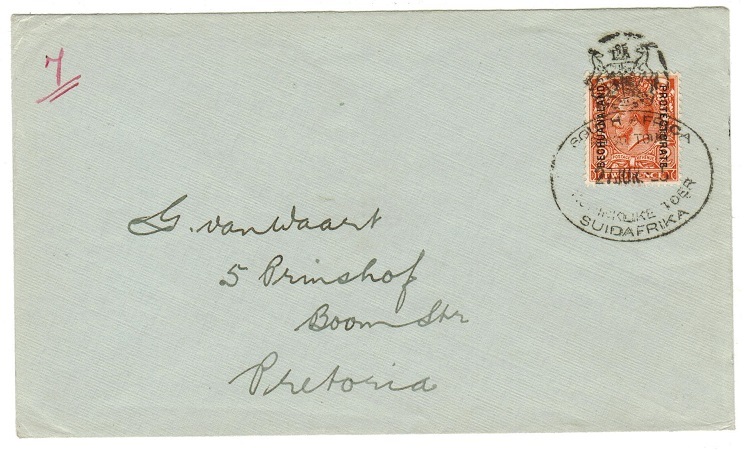 cover addressed to Pretoria bearing Transvaal 2d adhesive tied by s/r KEIMOES/BECHUANALAND. A scarce usage. BECHUANALAND - 1910 1d rate postcard use to UK used at MALAPYE SIDINGS. 1910 (NO.10.) use of picture postcard addressed to UK depicting 'Main Road-Beaconsfield' bearing Edward VII 1d red adhesive tied by light MALAPYE SIDINGS/C.G.H. cds with MAFEKING transit cds at left. Proud type D2. An elusive cancel during the Cape period. 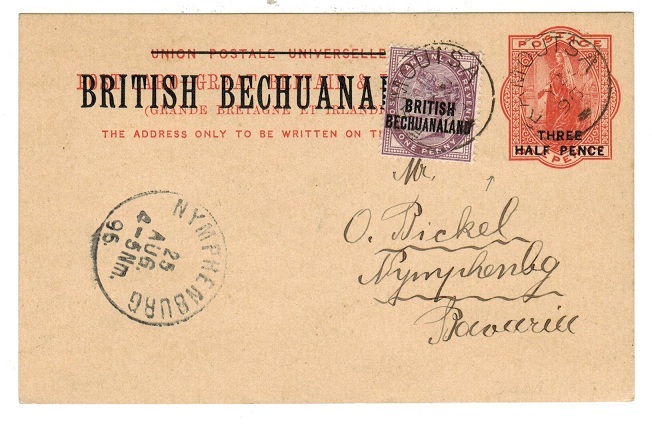 BECHUANALAND - 1923 OHMS cover to USA used at MAFEKING. 1923 (AU.8.) 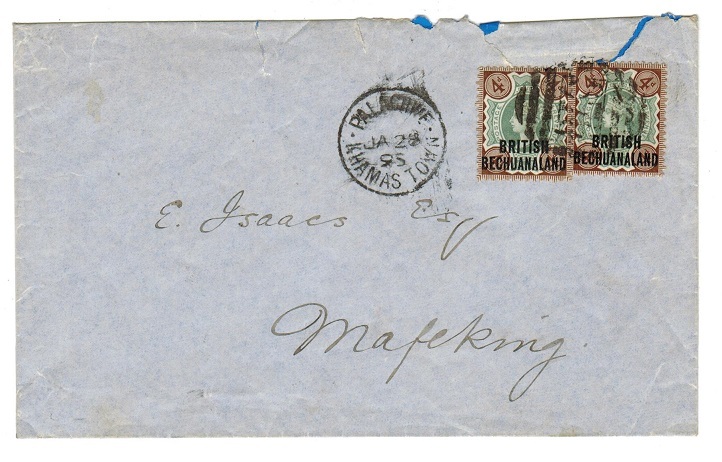 use of ON HIS MAJESTYS SERVICE (P.805) envelope addressed to USA cancelled by MAFEKING cds with violet oval rubber POST OFFICE/MAFEKING h/s at lower left. BECHUANALAND - 1888 1d brown PSC to UK used at VRYBURG. H&G 4. 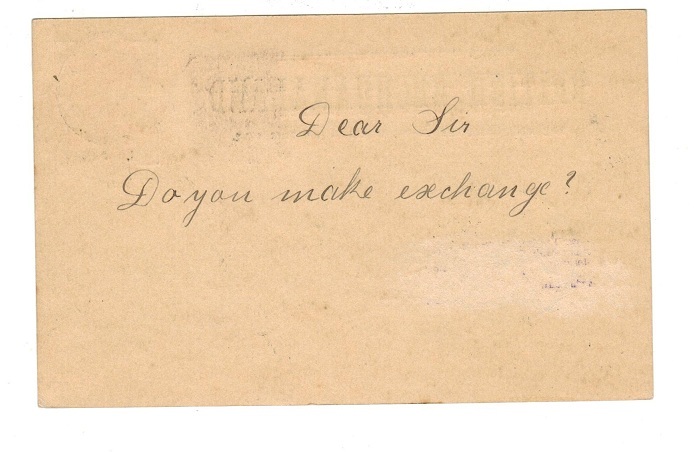 1888 1d brown on cream postal stationery postcard (some edge faults) addressed to UK cancelled by duplex cancel with VRYBURG cds alongside dated MY.22.94. H&G 4. BECHUANALAND - 1901 1/2d blue green PSC unused SPECIMEN. H&G 1. 1901 1/2d blue-green on buff postal stationery postcard in unused condition withg SPECIMEN applied diagonally in black on front. H&G 1. 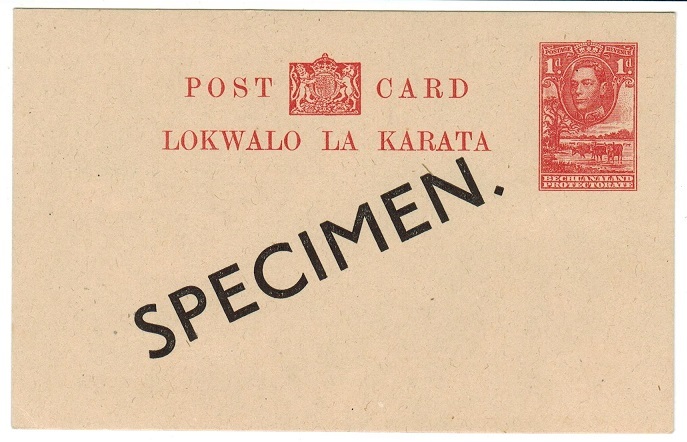 BECHUANALAND - 1901 1d PSC unused SPECIMEN. H&G 2. 1901 1d carmine on buff postal stationery postcard in unused condition withg SPECIMEN applied diagonally in black on front. H&G 2. BECHUANALAND - 1885 range of Fournier overprints on piece. 1885 range of five FOURNIER overprint types printed in black on cream card taken from the Fournier forgery handbook. 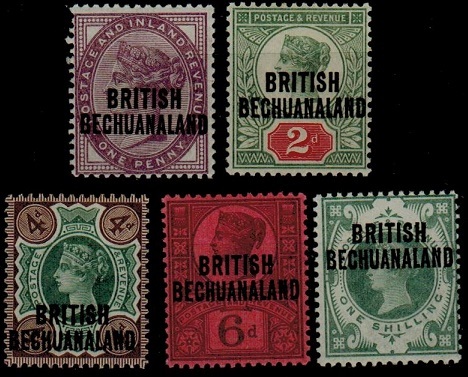 Three strikes of British Bechuanaland' and two strikes of the 'Bechuanaland Protectorate ' handstamp. 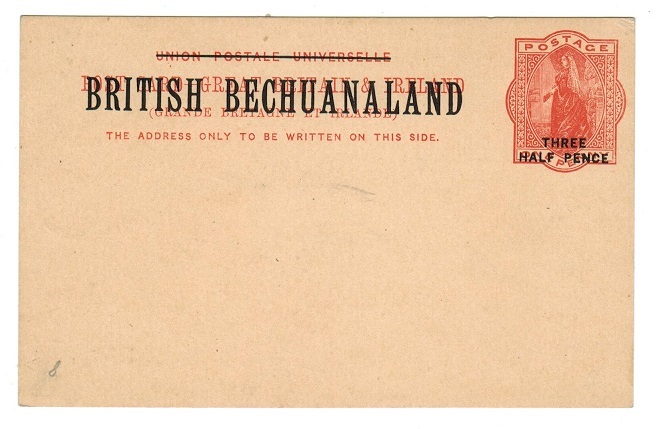 BECHUANALAND - 1944 3d+3d ultramarine unused postal stationery air letter. H&G 1. 1944 3d+3d ultramarine on buff postal stationery airletter in fine unused condition. H&G 1. BECHUANALAND - 1938 4d carmine-rose RPSE uprated to Johannesburg at GABERONES STATION. H&G 18b. 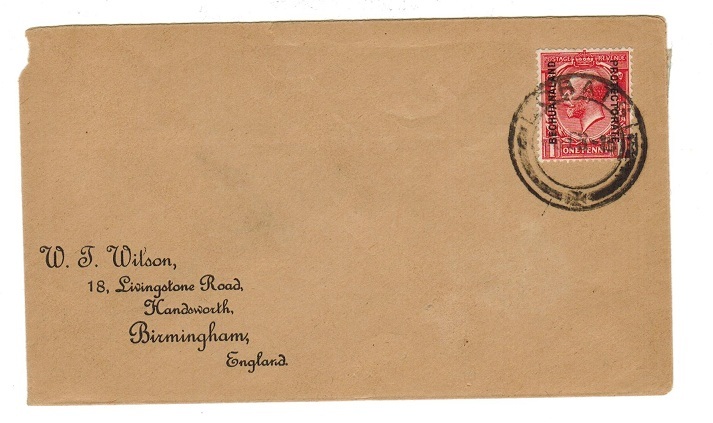 1938 4d carmine rose on cream reg'd postal stationery envelope (Size G- type 5) addressed to Johannesburg. Opened at left with small piece of corner missing but bearing additional 1d (SG 119) & tied by d/r GABERONES STA/BP cds dated 6.X.39. H&G 18b. 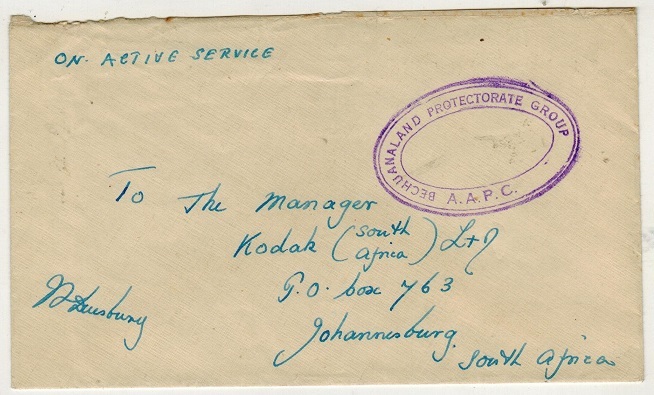 BECHUANALAND - 1940 stampless 'OAS' cover to Johannesburg with 'A.A.P.C.' h/s. 1940 circa stampless cover to South Africa & marked 'On Active Service' & cancelled by violet oval BECHUANALAND PROTECTORATE GROUP/A.A.P.C. h/s. 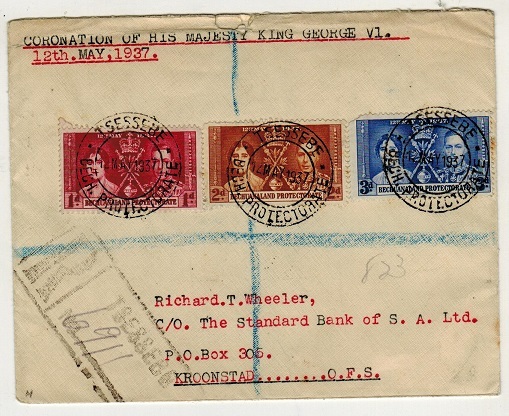 BECHUANALAND - 1937 'Coronation' FDC to Kroonstad used at TSESSEBE. 1937 (MAY.12.) 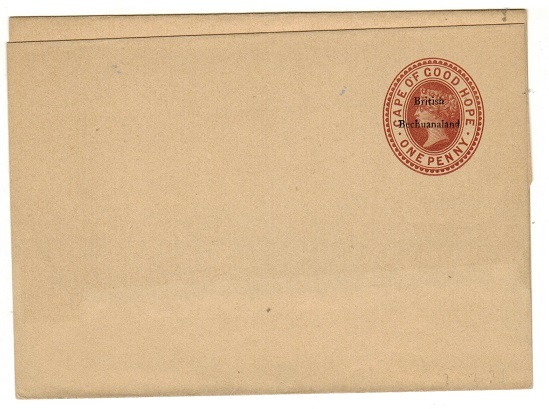 registered cover addressed to O.F.S. bearing the "Coronation" trio used on the first day of issue and cancelled by scarce d/r TSESSEBE/BECH.PROTECTORATE cds (Proud type D4) and with black boxed R/TSESSEBE/No…. H/s at lower left. BECHUANALAND - 1932 4d carmine rose RPSE to Germany used at LOBATSI. H&G 17. 1932 4d Carmine-rose on cream registered postal stationery envelope to Germany bearing additional 3d (SG 102) tied by fine LOBATSI cds's dated 28.APR.33. H&G 17. BECHUANALAND - 1934 'ROYAL TOUR H.R.H.PRINCE' GEORGE cover to Pretoria. 1934 (20.III.) 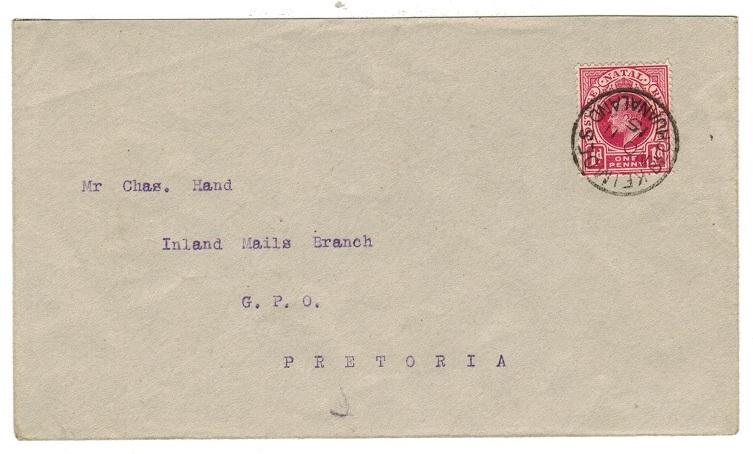 cover addressed to Pretoria (opened on two sides) bearing 4d adhesive tied by special crown oval ROYAL TOUR H.R.H.PRINCE GEORGE bilingual h/s. BECHUANALAND - 1888 1d brown PSC unused SPECIMEN. H&G 4. 1888 1d brown on cream postal stationery postcard in fine unused condition handstamped SPECIMEN in black italic lettering. H&G 4. BECHUANALAND - 1906 4d on 2d+1d brown RPSE unused SPECIMEN. H&G 8. 1906 'DUTY 4d' black surcharge on 2d+1d brown on cream registered postal stationery envelope (size F) in unused condition with type 1 imprint under flap and handstamped SPECIMEN. H&G 8. 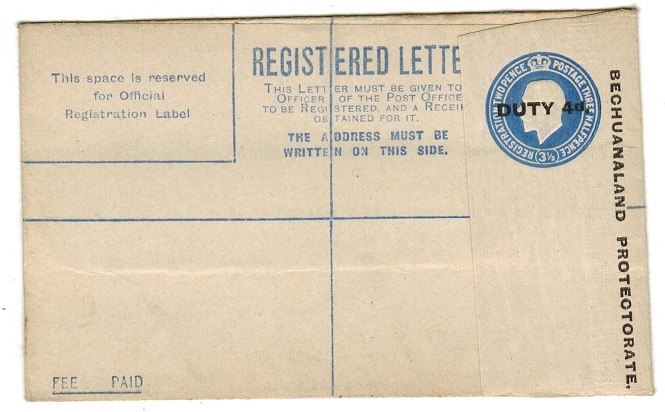 BECHUANALAND - 1945 3d blue air letter unused and unfolded. H&G 5. 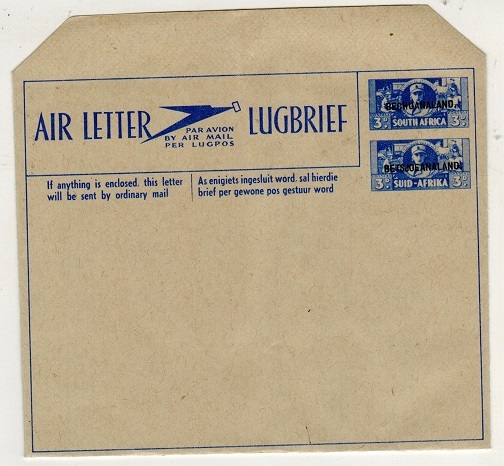 1945 3d Blue on smooth buff postal stationery air letter of South Africa showing 'Afrikan Text' overprinted BECHUANALAND in black. Unfolded as issued and with serial number at lower left. Unusual format. H&G 5. BECHUANALAND - 1888 1/- green pair cancelled SETLAGOLI. SG 46. 1888 1/- green 'un-appropraited die' adhesive pair cancelled by central s/r SETLAGOLI/ BECHUANALAND cds dated DE.3.90. SG 46. 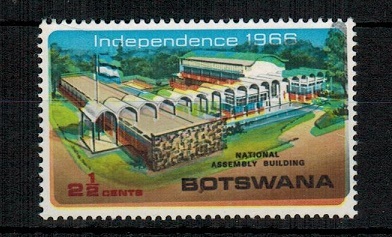 BECHUANALAND (Botswana) - 1966 2 1/2c 'Assembly Building' U/M with MISPLACED BLACK. SG 202. 1966 2 1/2c 'National Assembly Building' adhesive in fine unmounted mint condition showing the variety MISPLACED BLACK UPWARDS. SG 202. 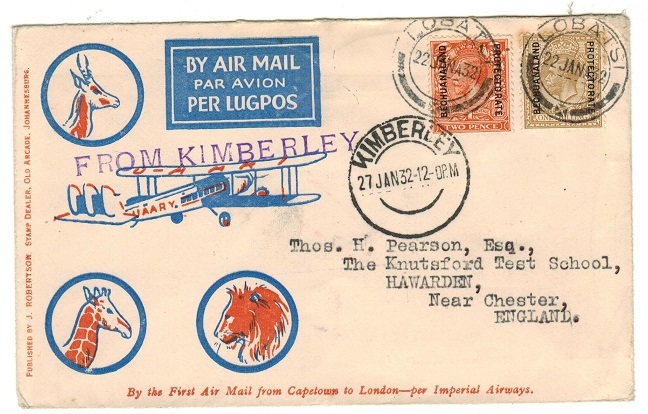 BECHUANALAND - 1932 first flight cover to UK 'VIA KIMBERLEY'. 1932 (JAN.22.) illustrated first flight cover addressed to UK bearing 2d and 1/- adhesives tied LOBATSI and struck by violet straight lined 'FROM KIMBERLEY' h/s and KIMBERLEY transit strike alongside. BECHUANALAND - 1888 £1 (SG type 5) unappropriated die IMPERFORATE PLATE PROOF struck SPECIMEN. 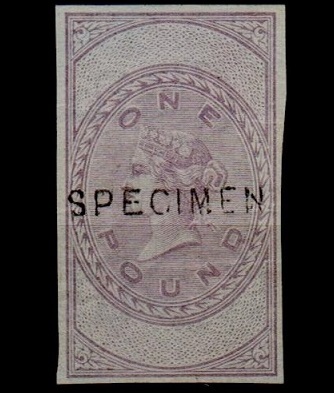 1888 £1 (SG type 5) 'un-appropriated die' IMPERFORATE PLATE PROOF printed in the issued colour of lilac (without overprint) and handstamped SPECIMEN in black on cream 'orb' watermarked paper. Fine and scarce. BECHUANALAND - 1889 1/2d red-brown postal stationery wrapper used at VRYBURG. H&G 7. 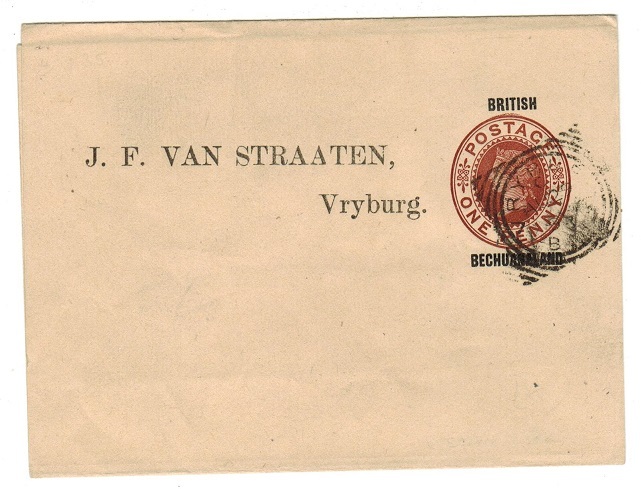 1889-93 1/2d red-brown on buff postal stationery wrapper pre-printed J.F.Van Straaten' address and cancelled by VRYBURG/B.B. squared circle cancel dated AU.29.95. A scarce item with this pre-printed address which is mentioned in the Bechuanaland stationery handbook by Thy and Inglefield-Watson. (WR7b). H&G 7. 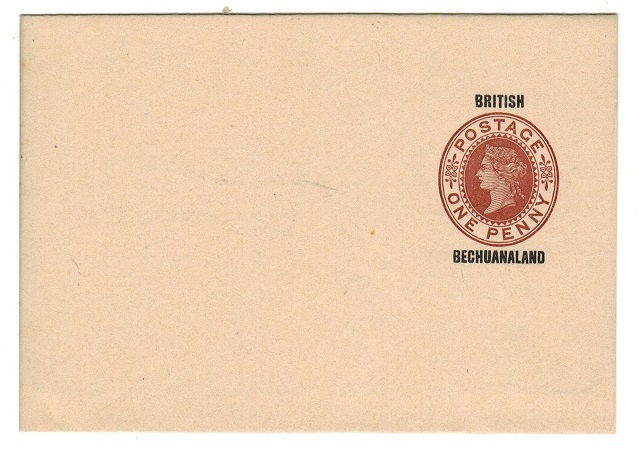 BECHUANALAND - 1889 1/2d red brown postal stationery wrapper unused. H&G 7. 1889-93 1/2d Red-brown on buff postal stationery wrapper in fine unused condition. H&G 7. 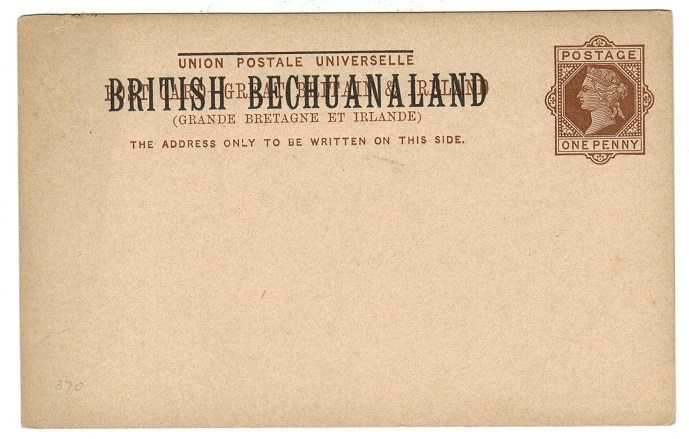 BECHUANALAND - 1885 1d red-brown postal stationery wrapper unused. H&G 2. 1885-86 1d red-brown on buff postal stationery wrapper in fine unused condition. H&G 2. BECHUANALAND - 1925 3d + 1 1/2d RPSE to Germany uprated at LOBATSI. SG 16. 1925 3d +1 1/2d red-violet on cream registered postal stationery envelope (size G) addressed to Germany bearing additional 1/2d and 2d adhesives tied by LOBATSI cds's dated 3.NO.26 (Proud type D4) with 'ET' code initials under flap. (May 1925 issue). H&G 16. BECHUANALAND - 1907 4d brown 'Duty' RPSE to Mafeking uprated at MAHALPYE. H&G 9a. 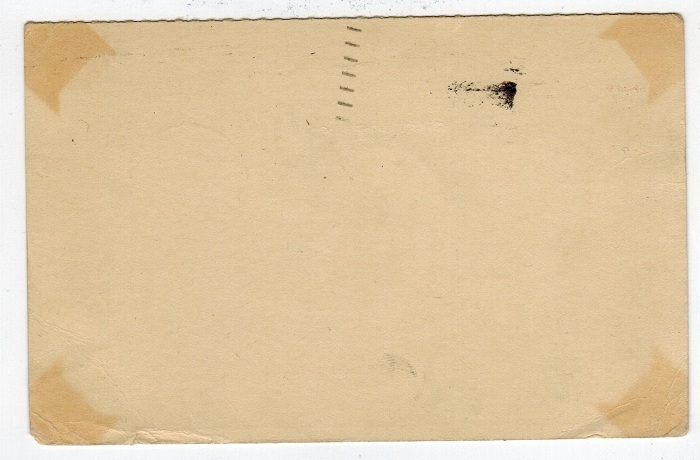 1907 4d+2d+1d brown on cream registered postal stationery envelope (size G) to Mafeking & bearing 1d 'Downey' adhesive (x4) with EDW 2 1/2d (x4) tied by light MAHALPYE/B.B.P cds's dated JA.4.13. H&G 9a. 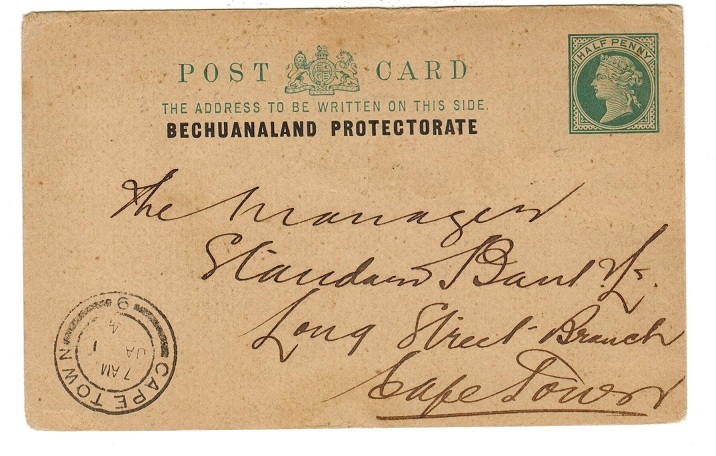 BECHUANALAND - 1900 2d rate cover to Port Elizabeth used at FRANCISTOWN. 1900 (AU.29.) 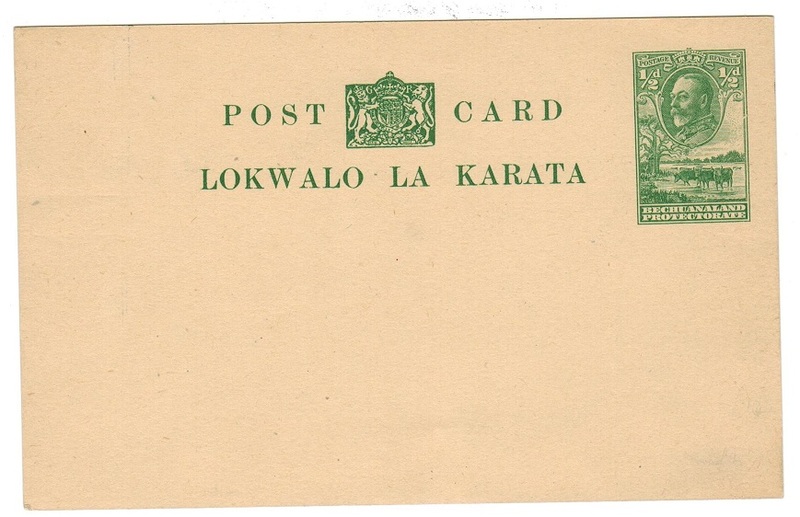 commercial cover addressed locally to Port Elizabeth (light central stain) bearing 1d lilac pair overprinted BECHUANALAND/PROTECTORATE cancelled by s/r FRANCISTOWN/S.AFRICA cds with additional strike at left. BECHUANALAND - 1907 1/2d blue green PSC with curved SPECIMEN applied. H&G 3. 1907 1/2d blue green on cream postal stationery postcard in fine unused condition with curved SPECIMEN h/s applied. H&G 3. BECHUANALAND - 1902 4d rate cover to UK used from PALAPYE with PASSED CENSOR 'Boer War' use. 1902 (JA.18.) 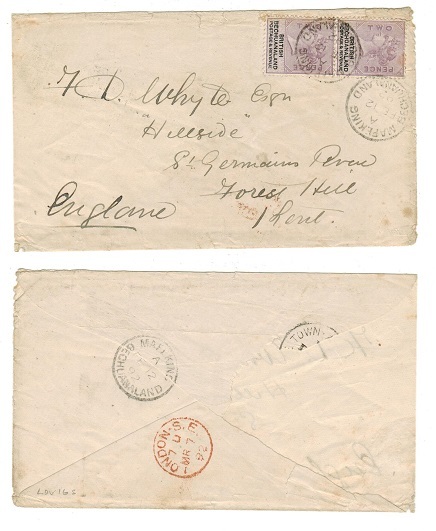 cover addressed to UK bearing 2d adhesive pair tied by light PALAPYE s/r cds with stronger strike below and struck by d/r PASSED CENSOR/W.ELTON/MAJOR/ KIMBERLEY h/s in black. A scarce Boer War cover. BECHUANALAND - 1890 1d brown PSC to Cape used at KANYE. H&G 5. 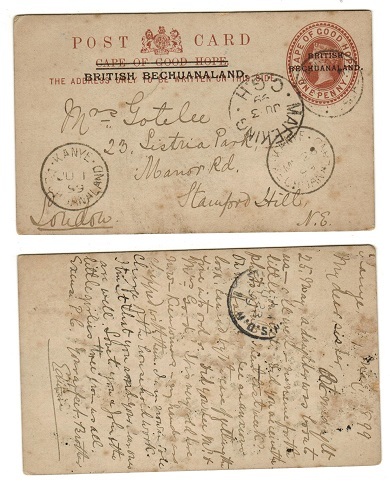 1890 1d brown on white postal stationery postcard of the Cape overprinted BRITISH BECHUANALAND and addressed to UK cancelled by KANYE/BECHUANALAND cds dated MY.28.99. H&G 5. 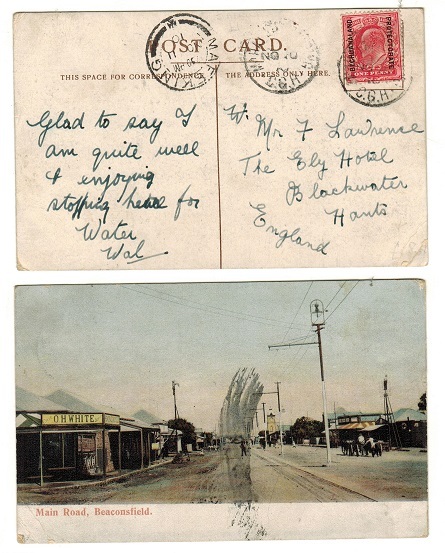 BECHUANALAND - 1907 1d rate postcard use to UK used at MOCHUDI/B.B. 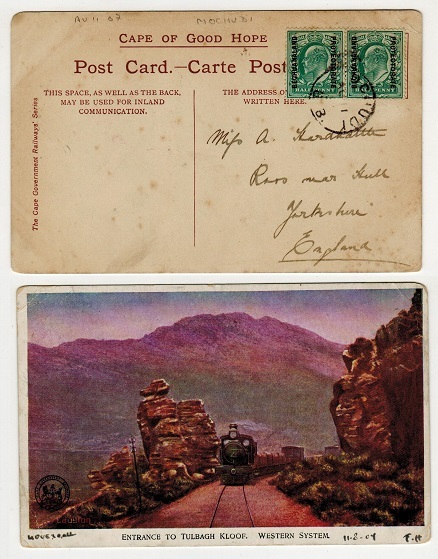 1907 use of coloured picture postcard addressed to UK depicting 'Entrance to Tulbagh Kloof, Western System' bearing 1/2d pair (SG 66) tied by MOCHUDI/B.B. cds. BECHUANALAND - 1953 6d carmine rose RPSE (size H2)unused. H&G 19a. 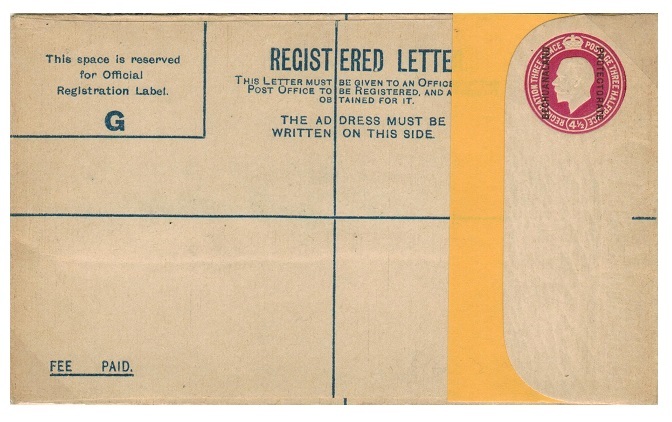 1954 6d carmine rose of cream registered postal stationery envelope (size H2) in fine unused condition. H&G 19a. BECHUANALAND - 1938 1d carmine PSC unused SPECIMEN. H&G 9. 1938 1d carmine on cream postal stationery postcard in fine unused condition with black SPECIMEN applied to front diagonally. H&G 9. 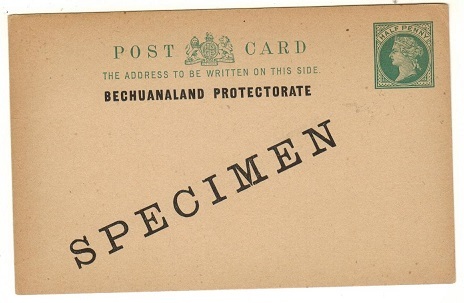 BECHUANALAND - 1938 1/2d green PSC unused SPECIMEN. H&G 8. 1938 1/2d green on cream postal stationery postcard in fine unused condition with black SPECIMEN applied to front diagonally. H&G 8. 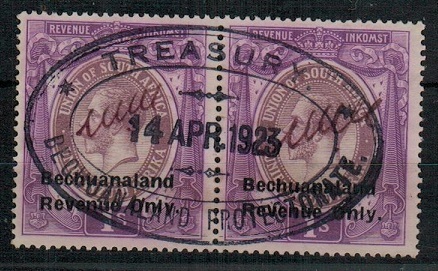 BECHUANALAND - 1923 1/- violet REVENUE pair used at the Treasury. 1923 1/- violet and deep purple South African REVENUE adhesive in a fine pair overprinted BECHUANALAND/REVENUE ONLY in black and cancelled by superb central oval TREASURY/ BECHUANALAND PROTECTORATE cancel dated 14.APR.23. and each stamp with manuscript initials. Barefoot and Hall 25 although his handbook states these stamps were not issued until 1926 !. BECHUANALAND - 1889 1/2d grey postal stationery wrapper to Germany used at MAFEKING. H&G 5. 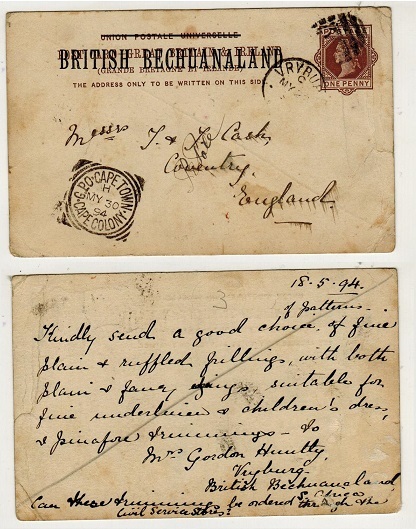 1889 1/2d grey on cream postal stationery wrapper of Cape overprinted BRITISH/BECHUANALND in red addressed to Germany and cancelled by MAFEKING/BECHUANALAND cds dated AU.8.95. Blue crayon 'T' applied with sexagonal 'T/15c' mark applied. H&G 5. 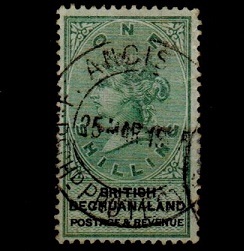 BECHUANALAND (Stellaland) - 1886 5/- green monogram adhesive mint. Barefoot 15. 1886 5/- green 'Republiek Van Stellaland' adhesive in fine mint condition (original gum) overprinted with violet crested mongram. Barefoot 15. 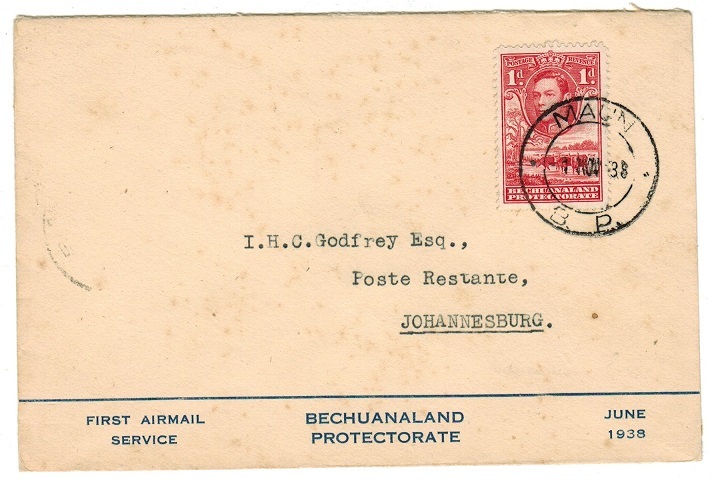 BECHUANALAND - 1938 first flight cover to Johannesburg used at MAUN. 1938 (NOV.1.) 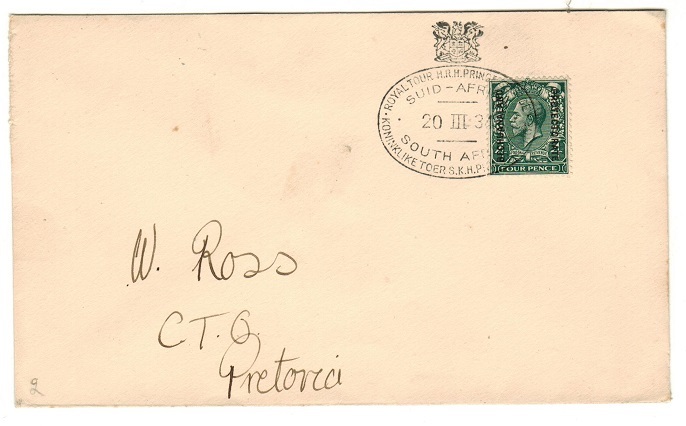 pre-printed first flight cover addressed to Johannesburg (light tone spots) bearing 1d adhesive tied MAUN/B.P. A scarce 1d local rate use on the 'Kalahari Feeder' service. 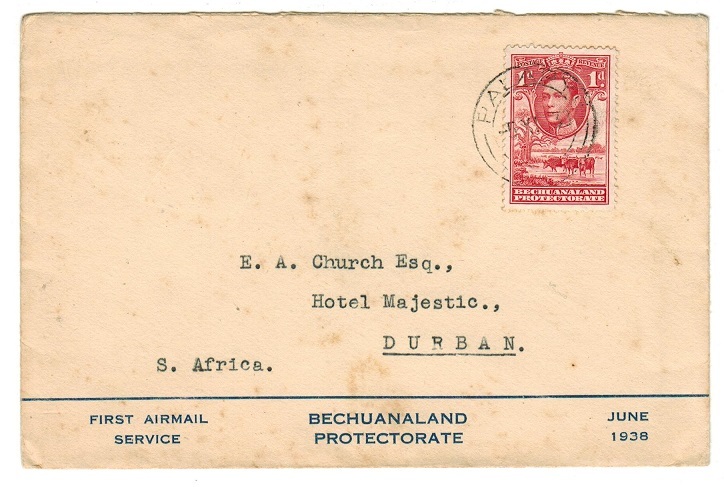 BECHUANALAND - 1938 first flight cover to Durban used at PALAPYE. 1938 (NOV.5.) pre-printed first flight cover addressed to Durban (light tone spots) bearing 1d adhesive tied PALAPYE cds. A scarce 1d local rate use on the 'Kalahari Feeder' service. 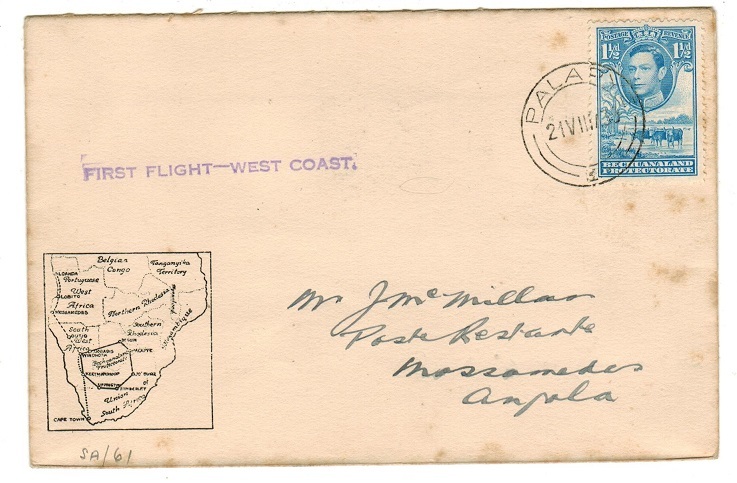 BECHUANALAND - 1939 first flight cover to Angola used at PALAPYE. 1939 (21.VIII.) pre-printed first flight cover addressed to Angola (light tone spots) bearing 1 1/2d adhesive tied PALAPYE cds and with violet FIRST FLIGHT-WEST COAST h/s applied. 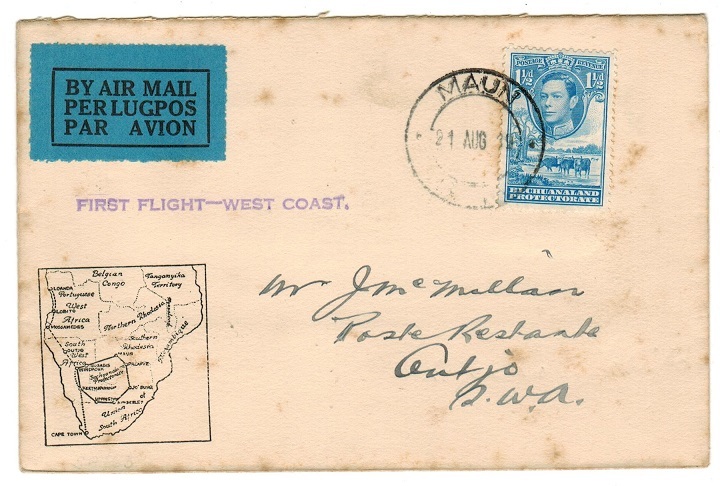 BECHUANALAND - 1939 first flight cover to SWA used at MAUN. 1939 (21.AUG.) 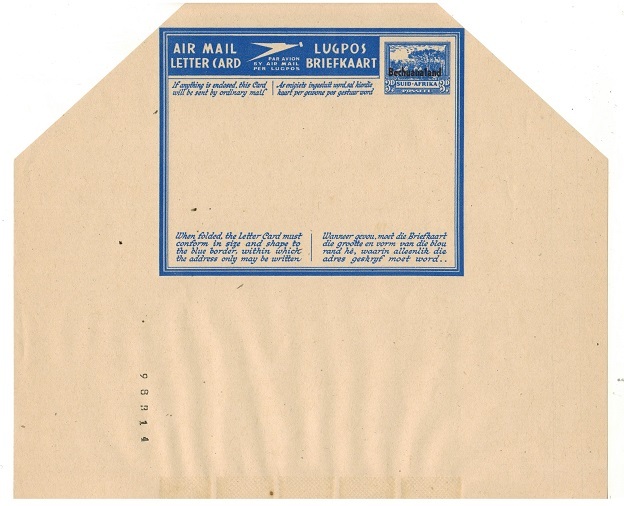 pre-printed first flight cover addressed to SWA (light tone spots) bearing 1 1/2d adhesive tied MAUN/B.P. cds and with violet FIRST FLIGHT-WEST COAST h/s applied. 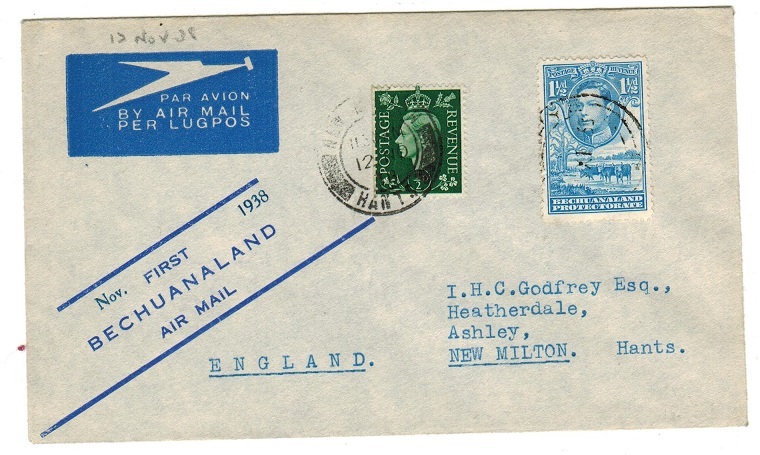 BECHUANALAND - 1938 first flight cover to UK. 1938 first flight cover to UK bearing 1 1/2d adhesive tied by weak PALAPYE cds on pre-printed NOV FIRST 1938/BECHUANALAND/AIR MAIL envelope with GB 1/2d added on arrival and cancelled NEW MILTON and dated 12.NOV.38. BECHUANALAND - 1925 'ROYAL TOUR' cover to Pretoria. 1925 (JUN.27.) 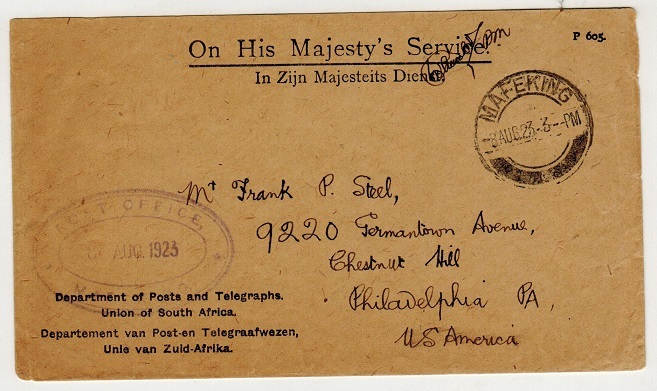 cover addressed to Pretoria bearing 2d adhesive tied by special crested SOUTH AFRICA/ROYAL TOUR biligual handstamp. The Royal Tour train being in Bechuanaland for two days only. 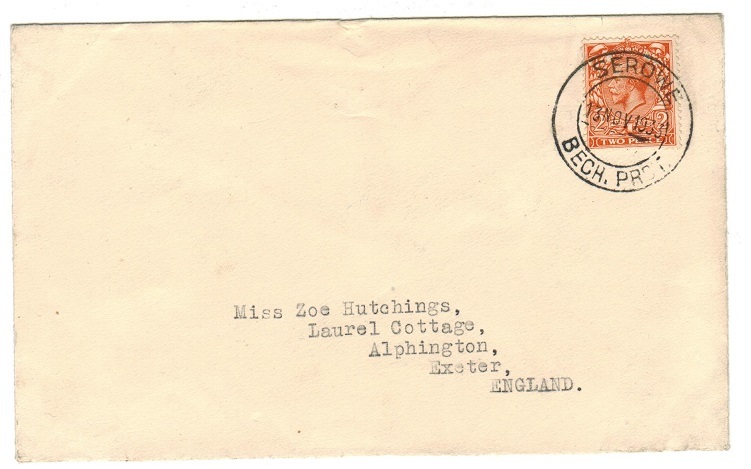 BECHUANALAND - 1921 registered cover to UK with 2d strip of three tied GABERONES VILLAGE. 1921 (OCT.26.) 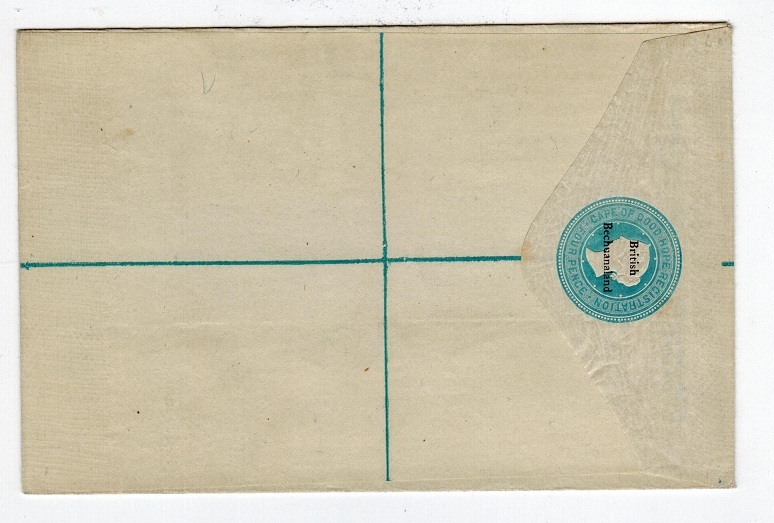 registered cover addressed to UK bearing 2d strip of three tied by d/r GABERONES VILLAGE cds (Proud type D5). BECHUANALAND - 1933 2d rate cover to UK used at SEROWE. 1933 (NOV.13.) cover addressed to UK bearing 2d adhesive tied by d/r SEROWE/BECH.PROT. cds (Proud type D5). Earliest recorded use of this type by 9 months. 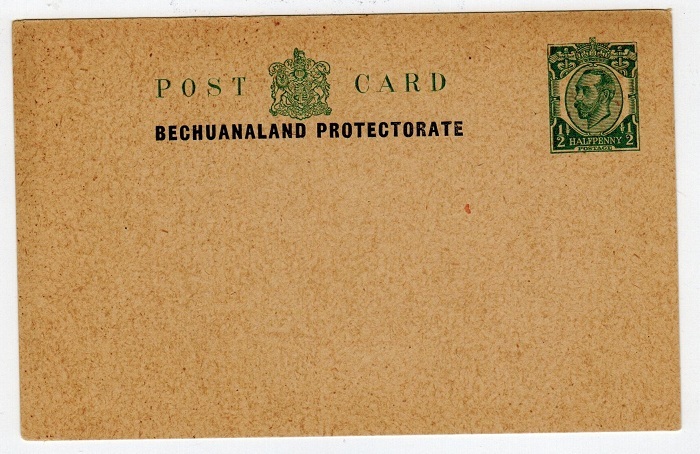 BECHUANALAND - 1913 1/2d green PSC unused. H&G 5. 1913 1/2d green on buff postal stationery postcard of the 'Downey' head in fine unused condition. H&G 5. BECHUANALAND - 1892 4d rate cover (faults) to UK used at MAFEKING/BECHUANALAND. 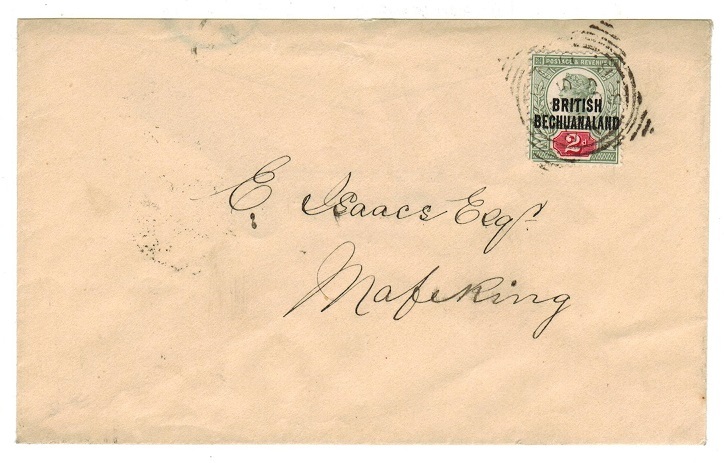 1892 (FE.12) cover to UK (ex one side of reverse flap) bearing un-appropriated die 2d pair (SG 11) tied by MAFEKING/BECHUANALAND cds with similar strike below. BECHUANALAND - 1895 2d rate local cover used at VYRBURG/B.B. 1895 (JY.5.) locally addressed cover bearing 2d (SG 34) tied by squared circle VRYBURG/B.B. cancel. BECHUANALAND - 1925 4 1/2d red-violet (size G) RPSE unused with 'E.T.' initials. H&G 16. BECHUANALAND - 1919 4d on 2d+1 1/2d blue (size F) RPSE unused with 'CO' initials. H&G 13. 1919 4d on 2d + 1 1/2d blue on cream registered postal stationery envelope (size F) in fine unused condition showing 'C.0.' initials under flap. H&G 13. BECHUANALAND - 1901 2d rate cover to Natal used at GABERONES with Boer War censor. 1901 (NO.8.) 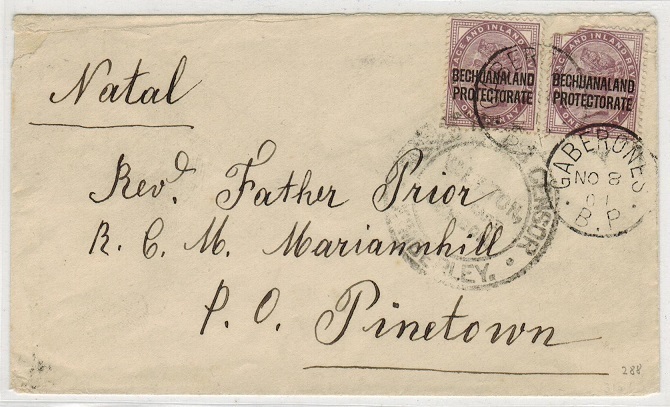 missionery letter addressed to 'Revd Father Prior' at Marianhill in Natal bearing 1d lilac adhesive pair (one damaged) tied by s/r GABERONES/B.P. cds and struck by large black d/r PASSED BY CENSOR/KIMBERLEY/W.ELTON censor strike used during the Boer War. PINETOWN/NATAL arrival b/s. BECHUANALAND - 1895 2d rate cover used at TAUNGS. 1895 (SP.2.) 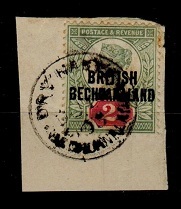 commercial cover addressed to Port Elizabeth (some worm damage) bearing GB 2d adhesive overprinted BRITISH/BECHUANALAND and cancelled by duplex strike with TAUNGS/ BECHUANALAND cds alongside. Oval violet commercial b/s with MIDLAND/TPO transit. BECHUANALAND - 1888 1/- green and black cancelled by French maritime cds. SG 15. 1888 1/- green and black 'unappropriated die' adhesive cancelled by central French maritime cancel. Unusual item. SG 15. BECHUANALAND - 1912 1/- deep green and scarlet fine mint. SG 70. 1912 1/- deep green and scarlet in fine mint condition. SG 70. BECHUANALAND - 1891 1d to 1/- set of five unmounted mint. SG 33-37. 1891-1904 1d to 1/- 'British/Bechuanaland' overprint set of five in unmounted mint condition. SG 33-37. 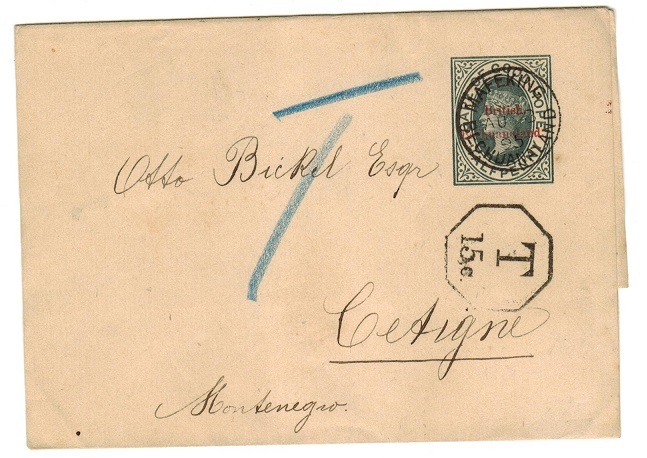 BECHUANALAND - 1886 1d postal stationery wrapper used locally from Vryburg. H&G 4. 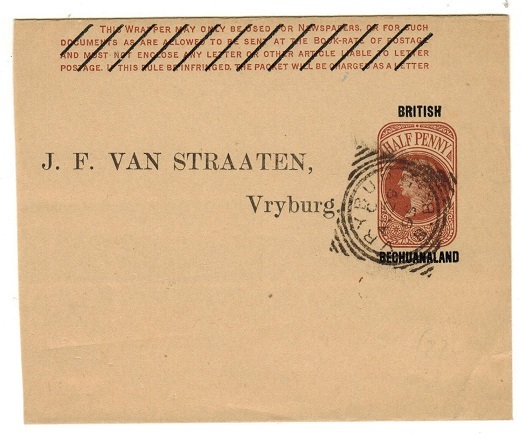 1886 1d red-brown on cream postal stationery wrapper of GB overprinted BRITISH/BECHUANALAND and pre-printed with 'J.F.Van Straaten/Vryburg' address cancelled by squared circle VRYBURG/B.B. cancel dated AU.29.89. H&G 4. BECHUANALAND - 1913 1 1/2d red-brown O 19 (I) mint control block of six. SG 75. 1913 1 1/2d Red-brown. A very fine mint O19 (I) control blk x 6. SG 75. 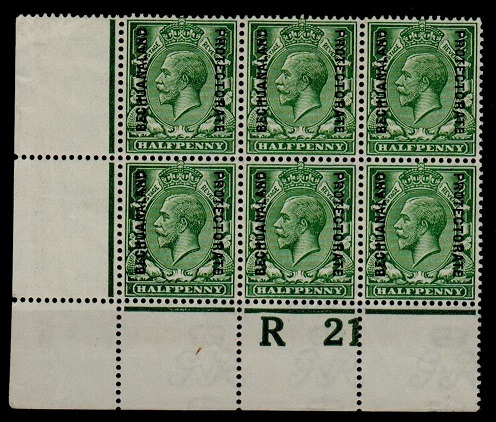 BECHUANALAND - 1913 1/2d green R 21 (P) mint control block of six. SG 73. 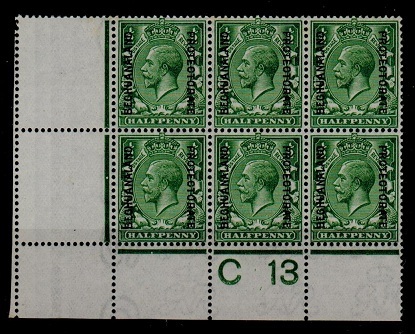 1913-24 1/2d green in a fine mint R 21 (P) control block of six. SG 73. BECHUANALAND - 1913 1/2d green O 20 (P) mint control block of six. SG 73. 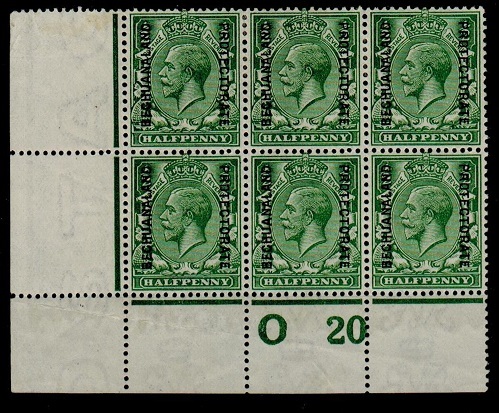 1913-24 1/2d green in a fine mint O 20 (P) control block of six. SG 73. BECHUANALAND - 1890 1d PSC to Port Elizabeth cancelled VRYBURG. H&G 5. 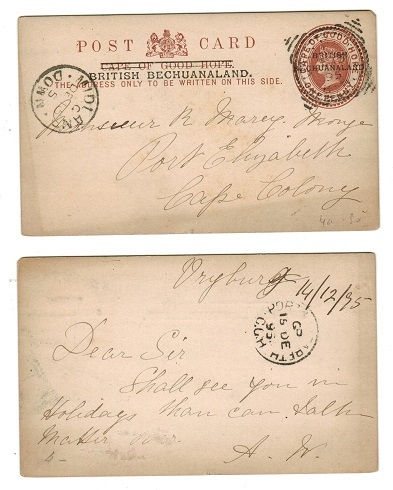 1890 1d brown on cream postal stationery postcard addressed to Port Elizabeth cancelled by squared circle VRYBURG cancel dated DE.15.95 and with MIDLAND/DOWN transit at left. Light shadow mark at bottom edge and with PORT ELIZABETH arrival b/s. H&G 5. 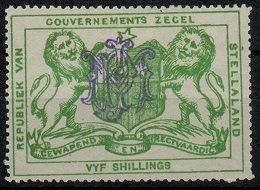 BECHUANALAND - 1932 4d RPSE to Natal uprated and used at MAHALAPYE. H&G 17. 1932 4d carmine rose on cream registered postal stationery envelope (size G) addressed to Natal (vertical central fold and some tone spotting) bearing additional 1d adhesive and tied by MAHALAPYE cds dated 21.MAR.36. H&G 17. BECHUANALAND - 1895 local cover with QV 4d tied '677' (Kayne) duplex. 1895 (JA.28.) cover addressed locally to Mafeking (Isaacs) bearing 4d adhesive pair tied by '677' duplex (Kanye) with PALACHWE/KHAMAS TOWN cds alongside. Roughly opened at top edge. MAFEKING/B.B. squared circle b/s. BECHUANALAND - 1886 4d RPSE (size G) unused. H&G 2. 1886 4d blue on cream registered postal stationery envelope of Cape Of Good Hope overprinted BRITISH/BECHUANALAND in fine unused condition. H&G 2. 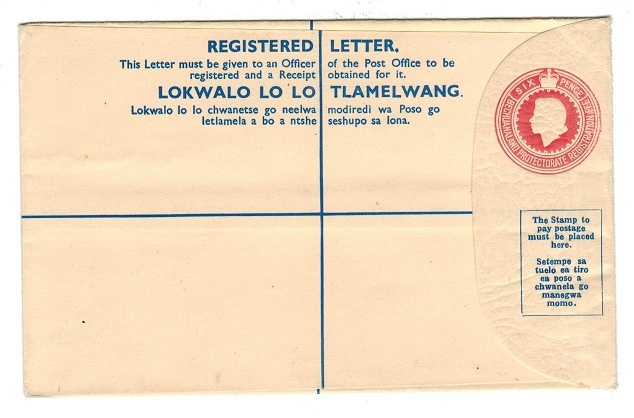 BECHUANALAND - 1914 registered cover to USA used at LOBATSI. 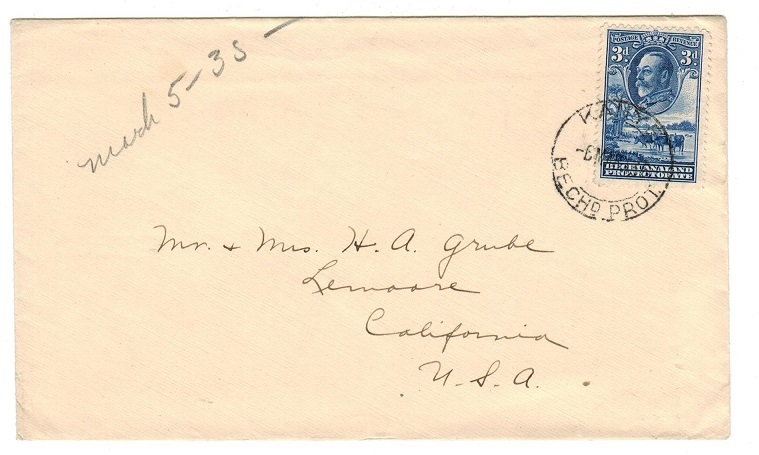 1914 (DEC.3) reg'd cover to USA bearing 2d & 2 1/2d pairs (SG76+78) tied by LOBATSI cds's. Violet boxed R/LOBATSI reg'd h/s at left. BECHUANALAND - 1935 3d rate cover to USA used at KANYE. 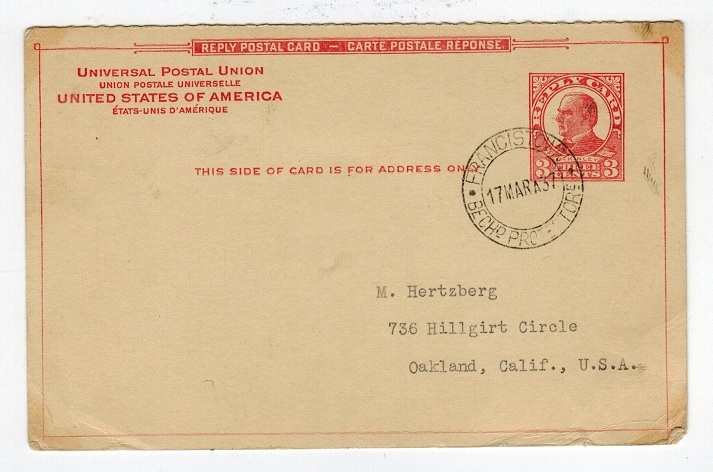 1935 (MAR.5) cover to USA bearing 3d (SG102) tied by d/r KANYE/BECHD.PROT cds. BECHUANALAND - 1937 local 1d rate cover used at MOCHUDI VILLAGE. 1937 (MAR.1.) 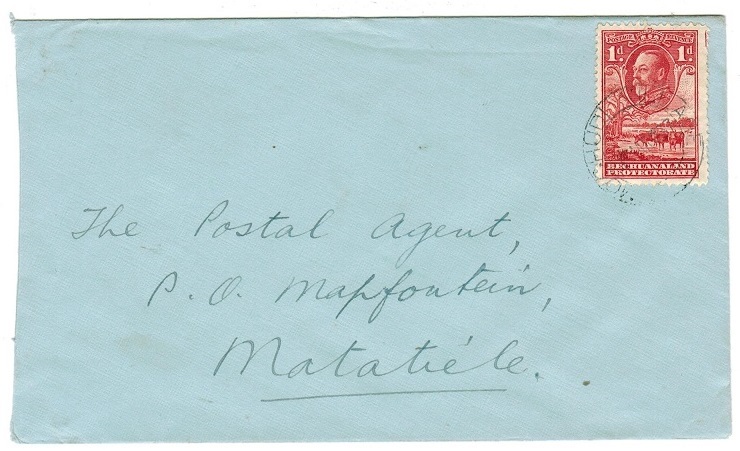 cover addressed to P.O.Mapfontein at Matatie'le in the Cape bearing 'KGV' 1d adhesive tied by MOCHUDI VILLAGE cds. Mapfontein arrival b/s. 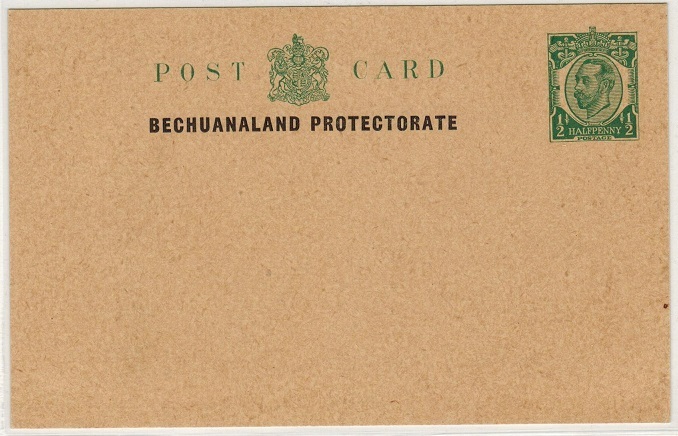 BECHUANALAND - 1945 cover to USA used at GABERONE VILLAGE. 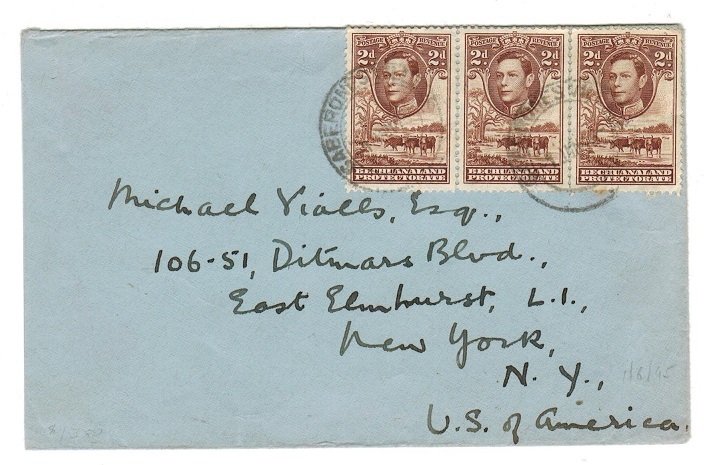 1945 (JUN.1) cover to USA bearing 2d strip of three (SG121) tied by two GABERONES VILLAGE cds's. BECHUANALAND - 1935 registered cover to UK with 2d 'Silver Jubilee's' used at TSESSEBE. 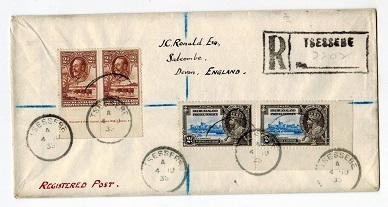 1935 (JU.4) reg'd cover to UK (slightly oversized homemade cover) bearing 2d pair (SG101) tied with bottom marginal 2d 'Silver Jubilee' pair (SG112) by various s/r TSESSEBE (Proud type D3). A scarce village use. BECHUANALAND - 1935 registered cover to UK with 3d 'Silver Jubilee's' used at KANYE. 1935 (JUN.14) reg'd cover to UK (slightly oversized homemade cover) bearing 2d pair (SG 101) tied with 3d 'Silver Jubilee' marginal pair by KANYE/BECHd PROT cds with black boxed R/KANYE/No... reg'd etiquette h/s. (Proud type D3). A scarce village use. 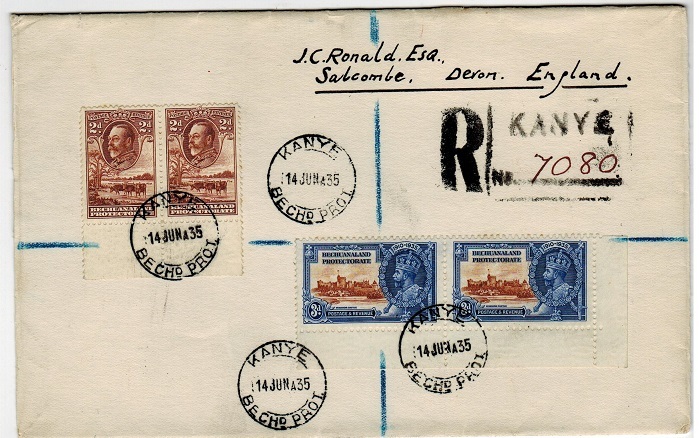 BECHUANALAND - 1951 stampless 'ECONOMY' OHMS cover to USA with 1/2d-2d 'Postage Dues' added. 1951 (21.III.) 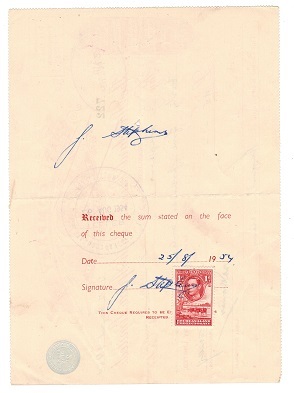 inward registered use of (Economy/Re-use) ON HIS MAJESTYS SERVICE long manilla envelope from Bahamas addressed to USA (2 vertical folds) and then re-directed to Bechuanaland cancelled by NASSAU/BAHAMAS cds dated 13.FEB.51 with red manuscript 'T 3 1/2d' annotation and with Bechuanaland 1/2d, 1d and 2d 'Postage Dues' added (SG D4-D6) tied by PALAPYE cds. A scarce use of these postage dues on cover. 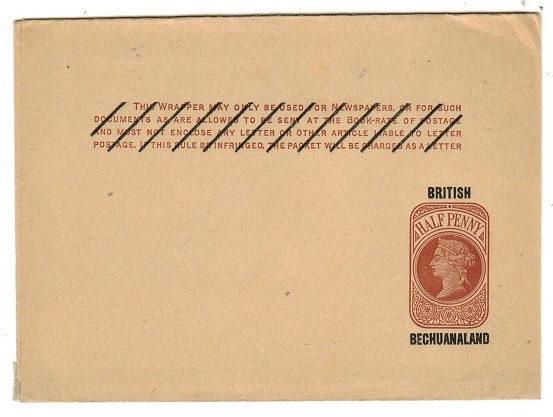 BECHUANALAND - 1935 OHMS cover from MAFEKING with OFFICIAL FREE cachet. 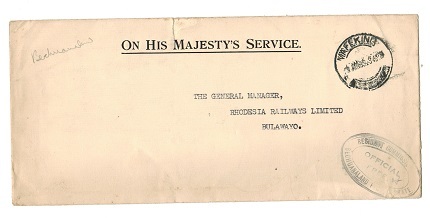 1935 (MAR.3) use of long white stampless ON HIS MAJESTY'S SERVICE envelope addressed to Bulawayo & cancelled by barred MAFEKING cds with black oval RESIDENT COMMIS- SIONSER/OFFICIAL FREE/BECHUANALAND PROTECTORATE h/s at lower left. BECHUANALAND - 1954 BECHUANALAND 2d STAMP DUTY 'Tati Company' cheque with KGVI 1d applied. 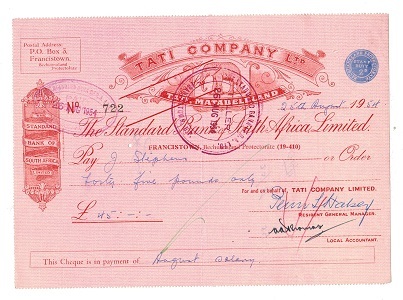 1954 use of illustrated red on white 'Tati Company Ltd' cheque with blue BECHUANALAND PROTECTORATE/STAMP DUTY 2d embossed seal at top right. 'KGVI' 1d adhesive adhered to reverse & used as revenue cancelled through with manuscript receiving signature. 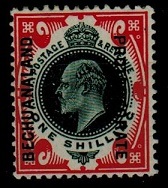 BECHUANALAND - 1893 1 1/2d on 1d red PSC unused. H&G 8. 1893 1 1/2d surcharge on 1d red on yellow-buff postal stationery postcard. Fine unused. H&G 8. BECHUANALAND - 1888 1d brown on buff PSC unused. H&G 4. 1888 1d Brown on buff postal stationery postcard. Fine unused. H&G 4. BECHUANALAND - 1886 1d red-brown postal stationery wrapper unused. H&G 4. 1886 1d Red brown on buff postal stationery wrapper. Fine unused. H&G4. 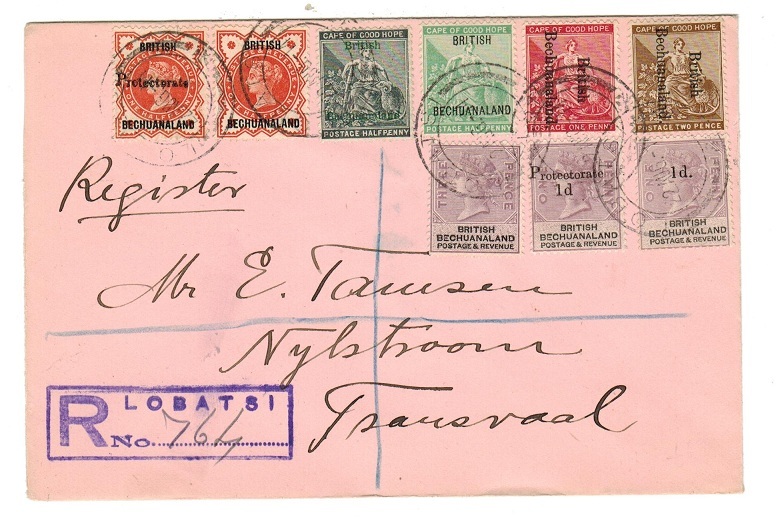 BECHUANALAND - 1914 'Tamsen' registered cover to Transvaal with scarce franking array. 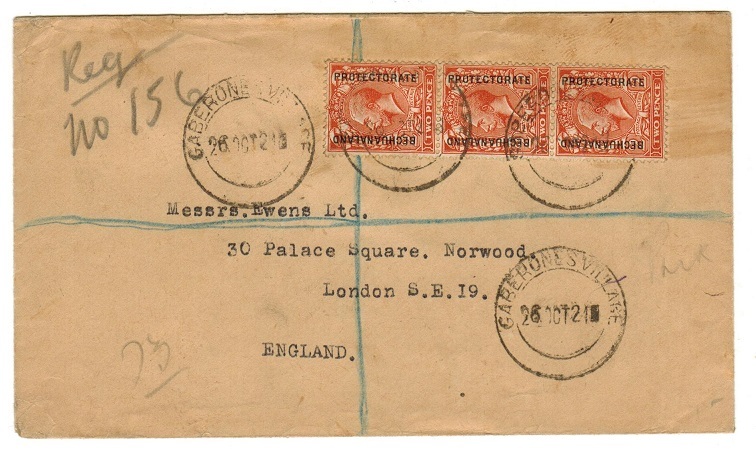 1914 (AUG.22) reg'd 'Tamsen' cover to Transvaal bearing 1/2d (SG 9) & later 'Protectorate' 1/2d (SG 40), un-appropriated die 3d (SG 12) & later 1d on 1d surcharge (SG 22) & 'Protectorate' 1d on 1d (SG 41) together with 1/2d (SG 30) & 1891 1/2d & 1d (SG 31+32) adhesives with Taylor & Marshall 1/2d (SG 56) tied by LOBTASI cds's (Proud type D4). Violet boxed R/ LOBATSI/NO. reg'd h/s at left. A high catalogued & scarce colourful franking. BECHUANALAND - 1915 cover to Pretoria bearing Natal 1d tied KEIMOES/BECHUANALAND. 1915 (NO.11.) 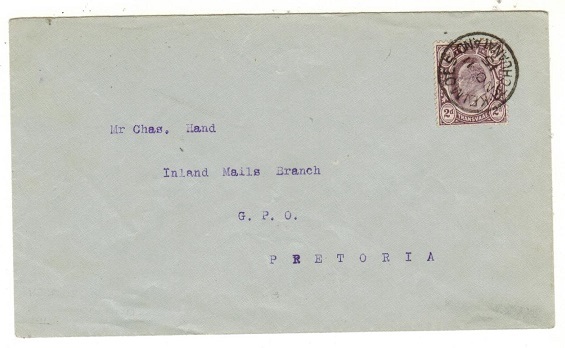 cover addressed to the GPO Inland Mails Branch at Pretoria bearing Natal 1d adhesive tied by very fine s/r KEIMOES/BECHUANALAND cds. A fine and very scarce use of this adhesive in Bechuanaland. 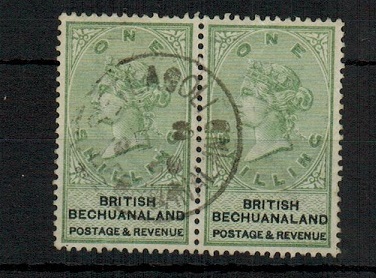 BECHUANALAND - 1901 1/2d green PSC to Cape Town. H&G 1. 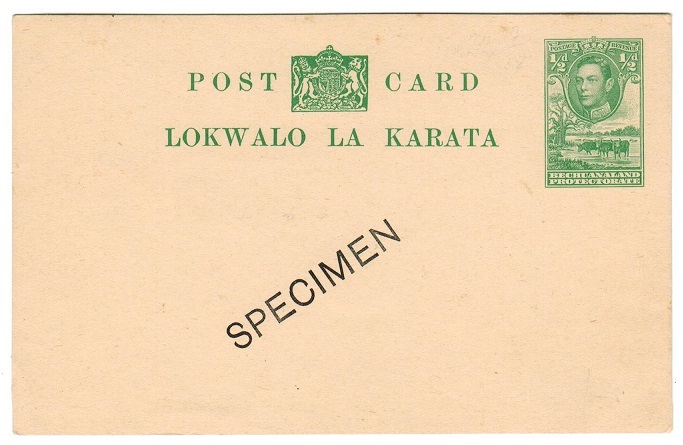 1901-05 1/2d blue-green on buff postal stationery p'card of 'GB' ovpt'd in black 'Bechuanaland Protectorate'. 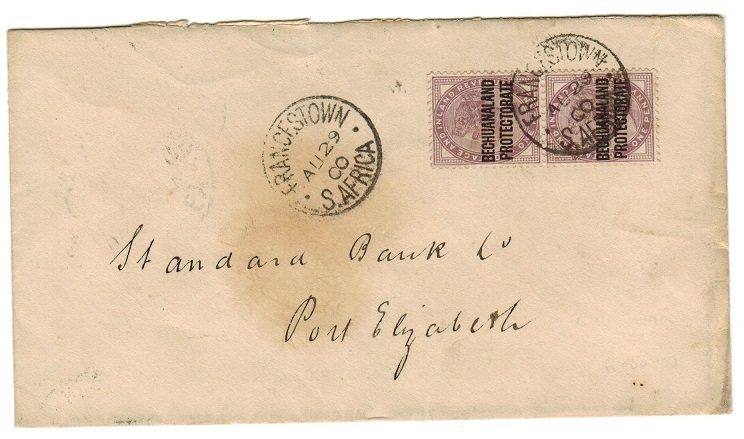 Addressed to Cape Town but uncancelled although reverse shows a fine strike of a commercial AMERICAN BANKING CORPORATION/FRANCIS TOWN h/s in violet dated 28.DEC.1903. A scarce genuine use of this elusive piece of stationery from Francistown with CAPETOWN arrival cds applied on front dated JA.1.04. H&G1. 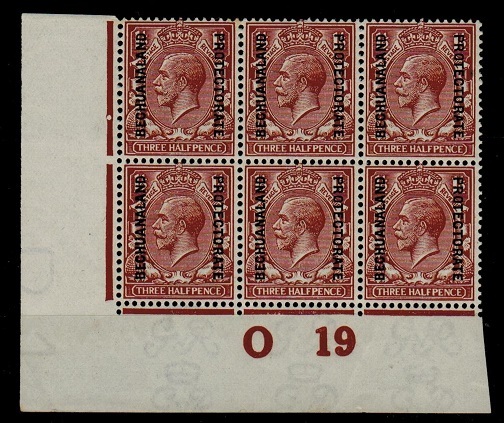 BECHUANALAND - 1893 1 1/2d on 1d red PSC to Germany uprated with additional 1d at RAMOUTSA. H&G 8. 1893 1 1/2d on 1d red on yellow buff postal stationery surchareged postcard addressed to Germany (Bickel) bearing additional 1d (SG 33) tied by RAMOUTSA cds with squashed Maltese cross at bottom & dated JY.26.95. A scarce uprated card. H&G8. BECHUANALAND - 1890 1d PSC to Kimberley used at VRYBURG. H&G 5. 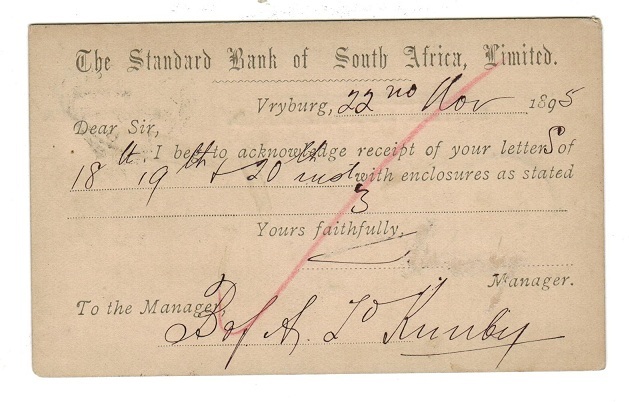 1890 1d Brown on white postal stationery postcard pre-printed on reverse by 'The Standard Bank of South Africa' for receipt use addressed to Kimberley & cancelled by part squared circle VRYBURG/B.B. cancel dated NO.22.95. H&G5. 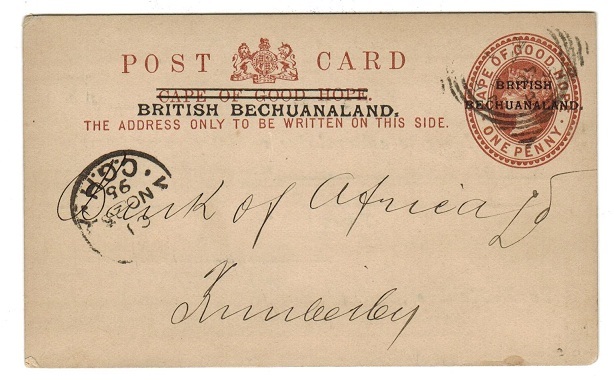 BECHUANALAND - 1888 1d PSC to Cape Town used at VRYBURG. H&G 4. 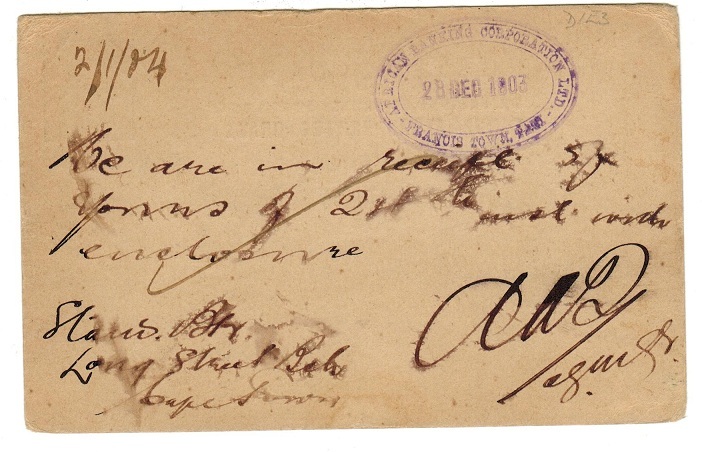 1888 1d Brown on buff postal stationery postcard addressed to S Africa & cancelled by VRYBURG cds dated NO.25.92. H&G 4. Scarce card. Cape Town arrival cds on front. BECHUANALAND - 1915 1d rate cover to UK used from LOBATSI. 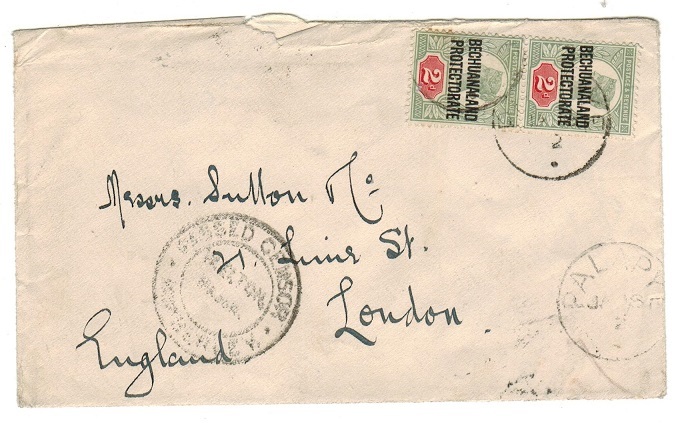 1915 (Feb.1) cover addressed to UK bearing 1d (SG 74) tied by LOBATSI cds. BECHUANALAND - 1885 Cape 1/- green unused overprinted MILITARY TELEGRAPHS. 1885 'Military Telegraphs' ovpt on Cape 1/- green adhesive in unused condition with sweated gum but of fresh appearance & good colour. BECHUANALAND - 1885 3d pale claret (SG 2) used at KENHART in the Cape. 1885-87 3d pale claret 'Seated Hope' adhesive cancelled by large part crisp (KEN)HARDT cds dated Y.23.87. Probably taken by trader and posted in the Cape. Nice usage. SG 2. BECHUANALAND - 1920 5/- rose-red mint marginal example. SG 89. 1920 5/- Rose-red 'Seahorse' in a very fine bottom marginal example showing part of the 'guide' marking. SG89. BECHUANALAND - 1891 2d (SG 34) tied to piece by rare DRY HARTS cds. 1891-1904 2d grey green and carmine adhesive (SG 34) tied to small piece by complete DRY HARTS/ BECHUANALAND cds dated JU.14.93. A very rare and elusive strike. BECHUANALAND - 1891 4d (SG 35) tied to piece by PALACHWE/KHAMAS TOWN cds. 1891-1904 4d green and purple-brown (SG 35) tied to small piece by complete PALACHWE/KHAMAS TOWN cds dated MY.9.97. (Proud type D1). BECHUANALAND - 1887 4d lilac and black mint handstamped SPECIMEN. 1887 4d lilac & black in fine mint condition (hinge remains) h/s'd locally by diagonal SPECIMEN h/s. (Samuel type BEC2). BECHUANALAND - 1913 1/2d 'Downey head' PSC unused. H&G 5. 1913 1/2d green on 'mottled' buff 'Downey head' postal stationery postcard in fine unused condition. An elusive piece of stationery. H&G 5. BECHUANALAND - 1913 1/2d green C 13 (P) unmounted mint control block of six. SG 73. 1913 1/2d Green. A very fine mint C 13 (P) control block x 6 in unmounted mint condition. SG73. 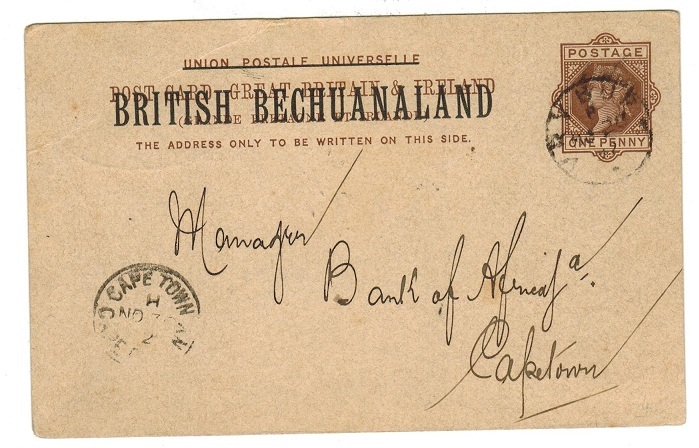 BECHUANALAND - 1937 use of USA 3c reply section 3c+3c PSC used at FRANCISTOWN. 1937 (MAR.17.) 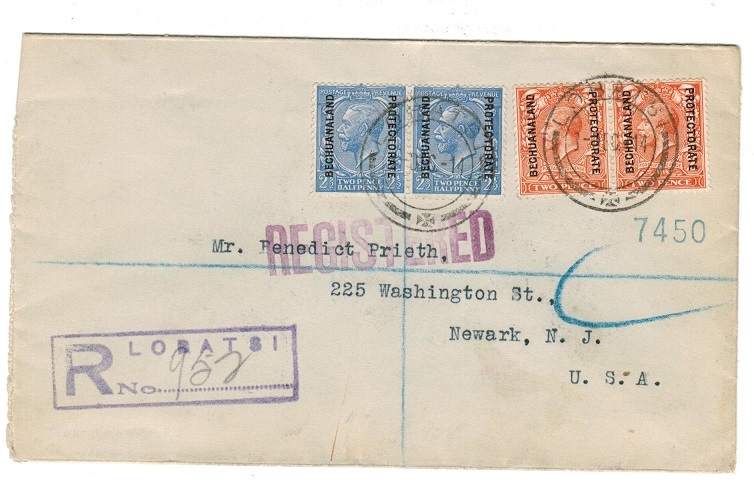 use of USA 3c reply section of the 3c+3c postal stationery reply postcard addressed to USA and cancelled at FRANCISTOWN/BECHd. PROTECTORATE. No message but an unusual usage. BECHUANALAND - 1886 4d RPSE unused. H&G 3. 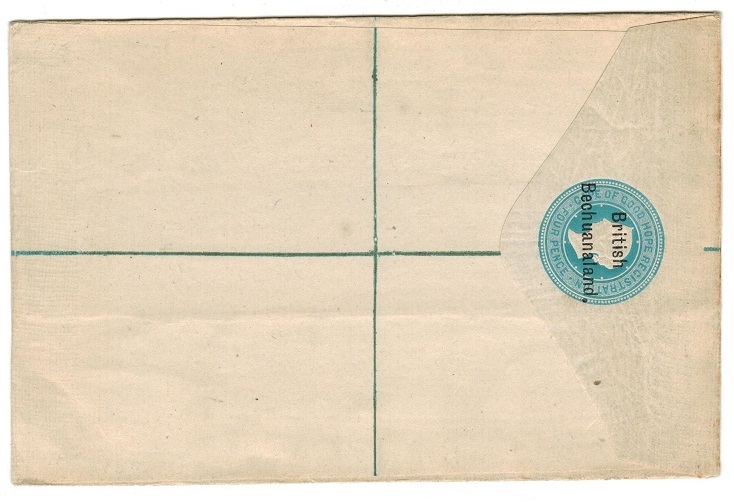 1886 4d blue on cream registered postal stationery envelope (size G) in unused condition. H&G 3. BECHUANALAND - 1887 4d on 2d RPSE unused. H&G 5. 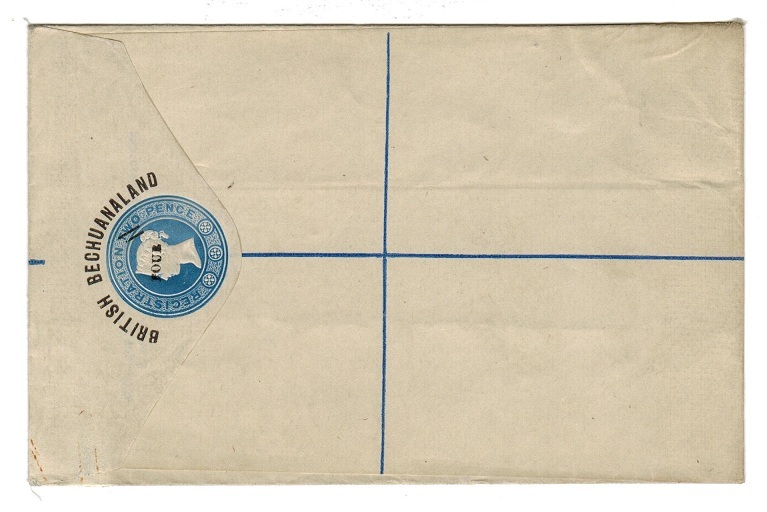 1887 4d on 2d blue on cream registered postal stationery envelope (size G) in fine unused condition with TYPE 1 bars. H&G 5. BECHUANALAND - 1954 6d RPSE unused. H&G 19. 1954 6d carmine rose on cream registered postal stationery envelope (size G) in fine unused condition showing type 6 imprint under flap. H&G 19. 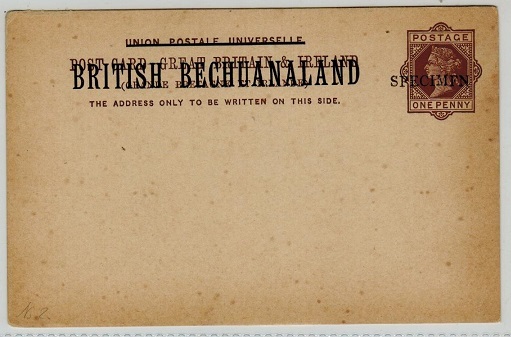 BECHUANALAND - 1932 1/2d 'pictorial' PSC unused. H&G 7. 1932 1/2d green on buff 'pictorial' postal stationery p'card in fine unused condition. Elusive item. H&G 7. BECHUANALAND - 1926 'Postage Due' trio fine used. SG D1-D3. 1926 'Postage Due' trio cto'd by superb central d/r BECHUANALAND PROT/H.O.MAFEKING cds's dated 12.V.27. These postage dues being exceedingly scarce in used condition. SG D1-3.